Discussion in 'China & Far East' started by nufix, Jan 14, 2013. Good job although 12 innocents have lost their lives but still great job security forces. May ALLAH bless you and help you we are with you and we love all our Indonesian brothers. Sorry for your loss Pakistan stands with you and would help you if you ask for it. Not 12, but only 2 innocent casualties, all terrorist are dead. Gak usah spekulasi bawah pelaku teror adalah pro atau punya latar belakang militer. A. Kokang senjata (tarik slide) pake tangan kanan? Kenapa? Keras ya slidenya? B. Jari kok masuk trigger guard? Clumsy sekali? C. Kok posisi jempol kiri menutupi jempol kanan? Gak bisa nahan recoil klo gini. D. Kok sikutnya bengkok? Recoilnya (hentakan) gak terkontrol donk. Mereka adalah pembom bunuh diri, biasanya teroris radikal mengirimkan anggota yang tidak terlatih/non-combatant untuk misi bom bunuh diri karena mereka lebih 'expendables' sedangkan yang skilled fighter adalah asset untuk dijadikan serdadu-nya. Assistant Commissioner of Police Untung Sangaji, this brave police managed to paralyze 4 of 7 Sarinah's bombers. 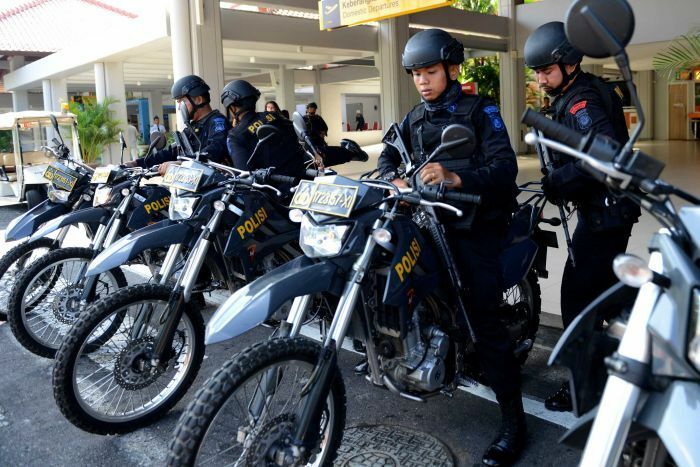 Indonesian special police are patrolling in Bali after President Joko Widodo ordered an increase in security on the resort island following the terror attacks in Jakarta. Indonesia's intelligence chief has asked for more power to detain suspected terrorists as security is beefed up across Bali in the wake of this week's deadly attacks in Jakarta. The head of Indonesia's National Intelligence Agency, the BIN, said his country has put too much weight on the legal rights of suspects. Chief Sutiyoso said the BIN's information-gathering had been hamstrung by Indonesia's current laws. "We don't have the authority to arrest or detain anyone and that's the problem," he said. Sutiyoso said countries like France and the United States had a better balance between national security and freedom and a greater ability to prevent terrorism. The intelligence chief said his agency did what it could within its legal limitations and that the BIN needed more power to gather information, and not just rely on wiretaps and documents. President Joko Widodo has ordered more police at hotels, airports and shopping malls across Bali after Thursday's attacks in Jakarta by Islamic State-linked militants. Government officials fear the Jakarta attack, in which seven people including all five militants died, could revive memories of Bali bombings in 2002 and 2005 and hinder the President's efforts to nearly double tourist arrivals to 20 million people by 2019. Bali's economy is already growing at its slowest pace since the financial crisis. "I'm a little scared but honestly there is probably more police out there right now," US tourist Mike Rosenthal said. "I'm probably safer now — just got to be careful, stay low and avoid tourist areas." Travel and tourism directly contributed around $US23 billion ($33.5 billion) to Indonesia's economy in 2014, or about 3.2 per cent of gross domestic product, according to a report from the World Travel & Tourism Council. At Bali's airport, tour guides said they were confident that any drop in business would only be temporary. "There is no problem. Bali is safe," said Yan Xiang Zhao, a tourist who had flown in from Taiwan with two friends. The Islamic State in Iraq and Syria (ISIS) is looking to declare at least one foothold in Asia in 2016, with the Philippines and Indonesia being the most likely targets, a terrorism expert said Tuesday. Southeast Asia has already emerged as a key recruitment center for ISIS, with more than 500 Indonesians and dozens of Malaysians joining the group and forming their own unit, the Katibah Nusantara(Malay Archipelago Combat Unit). Earlier this week, reports surfaced that two Malaysian suicide bombers from that unit had blown themselves up in Syria and Iraq in the last two weeks, killing more than 30 others (See: “Malaysian Islamic State Suicide Bombers Kill More Than 30 in Middle East”). But leaders and experts have also been warning that ISIS could gain a territorial foothold or at least establish a satellite presence in Southeast Asia. At last year’s Shangri-La Dialogue, Singapore’s premier Lee Hsien Loong warned that ISIS could “establish a base somewhere in the region,” a geographical area under its physical control like in Syria or Iraq (See: “Singapore Warns of Islamic State Base in Southeast Asia”). On Tuesday, in an opinion piece in The Straits Times, terrorism expert Rohan Gunaratna argued that ISIS is likely to create at least one branch in Southeast Asia this year – most likely in either the Philippines or Indonesia – with alarming consequences for the region. “ISIS is determined to declare at least one province in Asia in 2016,” Gunaratna, a professor at the S. Rajaratnam School of International Studies at Nanyang Technological University wrote in the Singapore-based newspaper. “An ISIS foothold will present far-reaching security implications for the stability and prosperity for a rising Asia,” he added. The main candidate for an ISIS branch, Gunaratna argued, is the Philippines. That is not surprising. The country has served as a training ground for terrorists before, including Al-Qaeda’s so-called Southeast Asian offshoot Jemaah Islamiyah. A number of local groups have pledged allegiance to ISIS self-appointed caliph Abu Bakr al-Baghdadi, with the Ahlus Shura (council) appointing Isnilon Hapilon – the leader of the Abu Sayyaf in Basilan – as the overall leader of the so-called Islamic State in the Philippines. “Shortly, ISIS will declare a satellite of the caliphate in the Sulu archipelago,” Gunaratna wrote. The consequences, Gunaratna argues, would be dire. If ISIS succeeds in creating a safe haven in Basilan and mounts operations from the Sulu archipelago, training camps will lure recruits from neighboring Asian states who cannot reach Syria, including Malaysia, Australia and even China. In addition, he argues that it is “very likely” that ISIS will dispatch explosive experts, combat tacticians and other operatives. As ISIS enforces its brand of Islam, beheadings, mass killings and other attacks are also likely to occur. To preempt all this, Gunaratna urged the Philippine military to deploy in strength in Sulu, Basilan and Tawi-Tawi as well as focus on winning Muslim hearts and minds to reduce ISIS support. “If the armed forces can dominate the Sulu archipelago, ISIS cannot successfully declare, operate and expand its satellite in the Philippines, with implications for Malaysia, the region and beyond,” he argued. The other candidate for an ISIS branch, Gunaratna wrote, is Indonesia. His case is much less developed here, though he is not alone in worrying about this. Just last month, Australian attorney-general George Brandis warned that ISIS had identified Indonesia as a location for a “distant caliphate”. Thus far, to their credit, Gunaratna acknowledges that the Indonesian military has “pre-empted” ISIS plans to declare a satellite state of the so-called caliphate in eastern Indonesia. This week, Indonesian police said that a more aggressive campaign is being launched focused on Poso and surrounding areas to find Abu Wardah – better known as Santoso – Indonesia’s most high-profile backer of ISIS. Elsewhere, Indonesian security forces have also made key arrests to stop planned attacks, including of several militants across Java in December with the help of the U.S. Federal Bureau of Investigation, the Australian Federal Police and Singaporean authorities. Task Force Konga XXXV-A / UNAMID (United Nations African Union Mission in Darfur) who carry out the mission as a Peacekeeper in Darfur Sudan Africa, received a visit from the Military Adviser to the Permanent Representative of the Republic of Indonesia (Penmil PTRI) of the UN in New York Brigadier General Jamaludin along with 8 officers team Verification TNI Headquarters, El Geneina in West Darfur, Sudan Africa, Friday (01/08/2016). Appearance Drum Band line Skull hosted by Army personnel who are members of the Task Force Battalion Mechanical Contingent Garuda XXIII-A / UNIFIL (United Nations Interim Force In Lebanon) wowed the hundreds of spectators who witnessed these performances, in the "Three Wise Men Parade" in UNP 7 -2, Monday (11/01/2016) South Lebanon. UNIFIL Sector East Commander, Brigadier General Juan Jesus Cabrero Martini (Spain) Visiting Force Headquarters Battalion Indobatt Mechanical Contingent Garuda XXIII-A / Unifil In Adshit Al Qusayr, UN Posn 7-1, South Lebanon, Thursday (01/14/2016). Pindad SMR (Licensed FN Minimi) is the current standard light machine gun of Indonesian Army units. The flag was found during raids conducted by police in Jakarta and across the country, during which four arrests were made and a militant was killed. Law enforcement officials also searched the derelict home of another dead bomber, identified as Muhammad Ali. All the militants were killed either by suicide vests or by police. Raids were conducted in Java, Kalimantan and Sulawesi, with four arrests made. A suspected militant was killed in a gunfight in central Sulawesi, which is where Abu Wardah Santoso, the country's most wanted Islamic radical, is holed up. The man leads the East Indonesia Mujaheeden network that has pledged allegiance to ISIS. The attack unfolded after five men stormed a Starbuck cafe and a traffic police booth with handmade bombs, guns and suicide belts. National police chief Gen. Badrodin Haiti told reporters that the attack - the first major assault in Indonesia since 2009 - was funded by the Islamic State group through Bahrun Naim, an Indonesian who spent one year in jail for illegal possession of weapons in 2011 and has joined ISIS in Syria. Supporters of the jihadist group, who attracted a few hundred Indonesians and Malaysians since it seized vast swathes of territory straddling between Syria and Iraq, also claimed responsibility for the attack on Twitter. One of the five attackers was identified as Sunakim, who was sentenced in 2010 to seven years in jail for his involvement in military-style training in Aceh, but was released early. In recent years, Indonesian counterterrorism forces successfully stamped out the extremist group Jemaah Islamiyah that was responsible for several attacks, including the 2002 bombings of bars in Bali which killed 202 people, as well as two hotel bombings in Jakarta in 2009 that killed seven people. Terrorism experts say IS supporters in Indonesia are drawn from the remnants of Jemaah Islamiyah and other groups. Jakarta residents remained shaken by Thursday's events but refused to be cowed. What will be the largest ship in the Philippine Navy is being launched by an Indonesian shipbuilder. MANILA, Jan. 15 (UPI) -- Indonesian shipbuilder PT Pal is to launch on Sunday the first of two strategic sealift vessels constructed for the Philippine Navy. The ship, a landing platform dock, is based on the Indonesian Navy's Makassar/Banjarmasin-class vessel. It is 404 feet long, 72 feet in the beam and weighs more than 11,500 tons when fully loaded. It will be used for disaster relief and in humanitarian missions and could also be used as a supply vessel in the South China Sea -- also called the West Philippine Sea -- where the Philippines is engaged in a sovereignty dispute with China. When commissioned into service, it will be the largest ship in the Philippine Navy. "We just got word from the Navy that the strategic vessel, one of two we have ordered from Indonesia, will be launched January 17 at the PT PAL shipyard in Indonesia," Armed Forces spokesperson Brig. Gen. Restituto Padilla said. "Key officials will be in attendance to see the launching of that ship." Padilla made the announcement on Friday, the Philippine Daily Inquirer. The strategic sealift vessel to be launched on Sunday can carry as many as 500 troops and their equipment. It is also capable of carrying two helicopters and will be armed. "It can stand alone as a command and control ship that can coordinate, rescue, recover and retrieve during disasters...It can also be used as a floating hospital in case our health centers and hospitals in provinces that were affected by disasters become unavailable," Padilla said. The ship is scheduled for delivery to the Philippine Navy in May. The second vessel will be delivered next year. The vessels were ordered in 2014, The STAR reported that shipbuilder PT PAL Indonesia (Persero) won the bidding for the purchase of two brand new strategic sealift vessels for the Philippine Navy. The notice of award for the P4-billion project was issued to the company in December 2014. Padang (ANTARA News) - Commander of the Air Force Operations I, Indonesian Air Force, Air Commodore Yuyu Sutisna, said Indonesia is ready to face any scenario that may emerge in relation to the dispute in the South China Sea. "We are not involved in the conflict, yet we must be prepared for any possibility," Yuyu said here on Tuesday. He said the Natuna air base, located close to the South China Sea region, has been now categorized as type B. "With the enhancement of this classification, there will be required infrastructural development that will happen in stages at the air base, and in regard to the show of military force," he added. According to Yuyu, the six other air bases that have seen improvement are Padang (West Sumatra), Palembang (South Sumatra), Tarakan (East Kalimantan), Lombok (West Nusa Tenggara), Marotai (East Nusa Tenggara) and Marauke (Papua). He said improvements at these seven air bases were based on the needs and demands of the regions, including their rapid development, need to keep pace with better technology as well as to counter threats from within and outside the country. In addition, certain improvements were also associated with the need to distribute aid in case of any disaster. Yuyu said such improvements were part of the efforts by the Indonesian Air Force to maintain the sovereignty of the country's territory. The Indonesian Air Force or TNI-AU Tentara Nasional Indonesia-Angkatan Udara (Jakarta Halim) has acquired a B737-500 from Garuda Indonesia (GA, Jakarta Soekarno-Hatta) for use on VIP transport flights. The twinjet, which was registered as PK-GGF (msn 28730) until it became A-7307 with the military, was handed over by Garuda CEO Arif Wibowo to Air Marshall Agus Supriatna at a ceremony held at Jakarta Halim last week. The TNI-AU's other VIP passenger transports include four B737-200Advs, two B737-400s, one B737-800, one Fokker 28-1000, two Fokker 28-3000s, and one Fokker 28-4000. What would be the cost of this ship? The officers handling the Sarinah attack must be kept in secret, they will be easily taken down by terrorist, even after they get retired from Police the possibility are still there. Kesibukan yang tak biasa terlihat di kawasan PT.PAL di Surabaya Jawa Timur. Selain menyiapkan kapal, sejumlah tenda juga tengah dibangun. Tak heran, pasalnya pada Senin pagi, PT.PAL akan meluncurkan 2 kapal sekaligus, yaitu PKR10514 pesanan Kementrian Pertahanan serta Kapal SSV pesanan Filipina. Dari pantauan ARCinc di lapangan, tampak PKR10514 sudah gagah terlihat berhadapan dengan kapal SSV. Di Kapal PKR juga sudah terlihat meriam 76mm, namun Millenium Gun yang seharusnya berada di belakang meriam utama tampak belum terpasang. Untuk Kapal SSV juga sudah terlihat utuh. Sekilas kapal ini mirip dengan LPD yang telah dibuat PT.PAL sebelumnya dengan kapasitas 2 helipad serta hangar. Dengan bobot 2300 ton, Kapal perang PKR 10514 ini bisa dibilang sekelas Light Fregat. Kapal sekelas ini sangat dibutuhkan oleh TNI-AL mengingat luasnya lautan yang harus dijaga, sekaligus mampu memberikan efek gentar. Seperti umumnya Light Fregate, PKR10514 akan dilengkapi sejumlah persenjataan mematikan. Sejauh ini belum ada rilis resmi mengenai jenis dan jumlah persenjataan PKR10514. Hanya saja disebutkan kapal ini nantinya memiliki kemampuan peperangan 3 dimensi, yaitu permukaan, udara dan bawah permukaan. Untuk peluru kendali, kemungkinan besar masih menggunakan keluarga besar Exocet. Namun, yang menarik, di belakang meriam utama, terdapat sejumlah peluncur rudal dengan sistem Vertical Launch. Kapal sepanjang 105 meter ini juga memiliki helideck dengan kapasitas heli mencapai 10 ton. Bahkan, menilik dari rancangan yang ada, PKR nantinya akan memiliki hangar khusus helikopter. Suatu hal yang tak dimiliki oleh kapal perang kelas Sigma TNI-AL sebelumnya. Yang menarik juga, ketika ARCinc mendatangi PT.PAL tampak satu modul telah tiba dari Belanda. Modul ini nantinya akan dipasang pada kapal perang PKR10514 kedua. Sistem TOP SKY secara teknis memiliki beberapa kelebihan diantaranya, memiliki flight plan format terbaru sesuai standar International Civil Aviation Organization (ICAO), Basic Air Traffic Management (ATM) System (SDPS, FDPS, Flight Trajectory Calculation, dan lain-lain), Controller Pilot Data Link Communication berbasis IP, Electronic Strip dan ADS-B Surveillance. "Sistem ini juga memiliki fungsi Operation, Simulator & Computer-Based Training, penambahan fitur perhitungan separasi untuk proseduran maupun surveillance secara longitudinal dan lateral yang lebih optimal, serta memiliki spesifikasi hardware dengan teknologi terkini," pungkas Bambang.